On Match Predictor, you can score by predicting the correct result, the correct scoreline, the correct margin of victory, and the correct number of goals scored for all 64 matches. Who will win the 2018 FIFA World Cup? Well, there is a month to go before we get the answer. However, there is nothing wrong in hazarding a guess, or even making predictions about the matches leading up to the title. And if the guesses and predictions come with some reward, it’s worth the effort. FIFA has its Match Predictor ready and an Apple Macbook and an iPad, among other prizes, are up for grabs if your predictions are spot on. 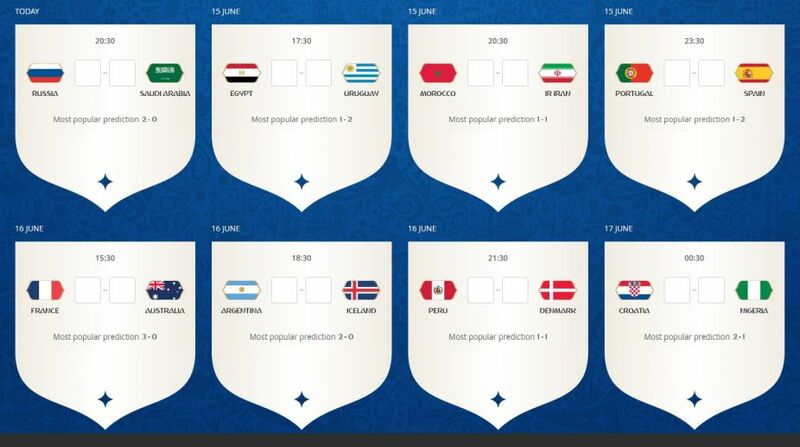 You can predict for all 64 matches to be played in Russia, in batches or daily. The Match Predictor will first throw up the 48 Group Stage menu, from where it will be on to the knockouts — the round of 16 . For each of the 48 group-stage matches, you can predict the scoreline and answer one bonus question. In the knockout phase, you need to predict the scoreline and get two bonus questions to answer. And if you think you have made an unfeasible prediction, or playing conditions and combinations have changed since you made your prediction, the Match Predictor gives you an option to change it. For each match, you can score points for predicting the correct result, predicting the correct scoreline, predicting the correct margin of victory, and predicting the correct number of goals scored. You can score between 1 and 100 points for correctly predicting the right result, scoreline and margin of victory, while 1 to 50 points can be scored for correctly predicting the number of goals scored. FIFA says being brave may pay off, because you score will depend on how many other players have made the same prediction. The fewer they are, the more points you get. The Match Predictor page will have a guide to the number of points that can be earned for each prediction. Points will be updated ‘live’ during the match. Bonus questions can be answered only after the line-ups have been announced, say around an hour before the kick-off. You will earn 30 points for each correct answer. There are jokers in the pack too. For every matchday, you can choose one of your predictions to be your joker. The joker will score you double points if correct. And, for the record, there will be 25 matchdays. Like your predictions, Joker selections can also be changed any time up until the kick-off. You can also have your own private league or a one-on-one challenge. Match Predictor allows you to create or join either of these at any point during the tournament by sharing a unique link via email or on social media. You can compete in up to 20 private leagues, and the number of head-to-head challenges is unlimited. Finally, you should know where all this action is happening. You can play the Match Predictor online on the FIFA website. Alternatively, download the Match Predictor app from Play Store or App Store for Android or Apple devices, respectively.